This weekly reading log allows students to think about their reading, set goals and track progress. Help keep students reading and parents focused to their student's learning. Use for elementary students to record independent reading in class and at home. Parent/Student Announcement & Guidelines for Class Reading: Outlines all the specific details, goals, use, and examples for reading in class. Parent/Student Announcement & Guidelines for Home Reading: Second part of parent/student announcement that provides specific information and expectations for reading at home. Reading Contract: Student reading commitment letter for both student and parent to read and sign. Designed to set expectations early and clearly. Reading Log for Class: Records independent reading completed in class. Includes space for title, author, pages, and minutes read. Students evaluate how difficult they personally found comprehension. 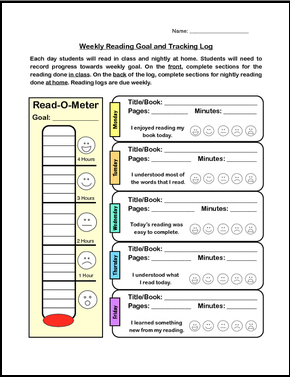 There is a "read-o--meter" so students can track their progress on a graph. This log strongly encourages students to choose materials beyond books: newspapers, magazines, online resources, poetry, historical documents, etc. Reading Log for Home: Records nightly reading at home. Includes sections for title, author, pages read and minutes read. Student are asked to evaluate their book. 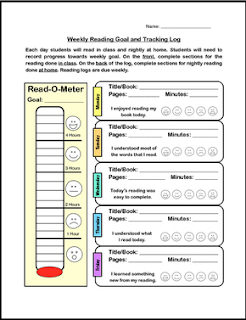 Gives students an opportunity to set a reading goal (in minutes) each week and mark their progress towards that goal. Goals are met through a combination of independent reading in class, nightly assignments and “extra effort”. The “extra effort” section rewards students motivated to read on weekends and holidays. There is a reading contract included that requires student and parent signature. Students are also asked to rate the difficulty for text read in class and enjoyment for books read at home. The rating system allows instant feedback for students, teachers and parents. Built-in instant feedback tools help everybody stay engaged. Emoticons are used for each day's reading to further evaluate the reading experience. Interested in other teaching tools? Follow the link for similar products:"TEACHING TOOLS"